Cast Iron Radiators Ltd, as the UK's leading manufacturer of traditional radiators are determined to take a leadership role in corporate responsibility. Cast iron radiators are an environmentally friendly alternative to modern disposable pressed steel radiators because they are recyclable and have a longer lifespan. However, the manufacture of cast iron radiators invovles smelting iron at high tempretures, sand casting, machining, transporting heavy items, pressure testing, polishing and painting. 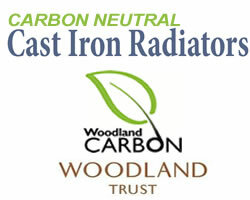 Therefore, Cast Iron Radiators Ltd are the first manufacturer of period radiators in the UK to team up with the Woodland Trust to neutralise the carbon footprint of our product. We have produced a series of cast iron radiators where the carbon released in their manufacture is neutralised by the planting of trees in the United Kingdom in accordance recomendations of the Woodland Trust. All of the below cast iron radiators come with a certificate from the Woodland Trust confirming that the cast iron radiator is carbon neutral. To understand more about our carbon footprint calculations, please do not hesitate to contact us.